Ureteral stent is an essential item for surgical procedures and clinical examinations in the urological field, but the methods and protocols of insertion, withdrawal, and exchange, as well as the period before replacement are based on the experience of an individual practitioner. Ureteral stenting is frequently associated not only with stent-related symptoms but also complications such as urinary tract infections, encrustation, migration, knotting, and ureteroarterial fistula conditions, which are sometimes life -threatening. The Japanese Society of Endourology (JSE) established a “the Section meeting for ureteral stenting” in order to establish consensus regarding the practice of the ureteral stenting in a handbook which was first published in Japan in 2017. 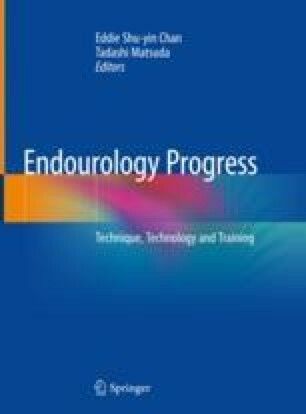 Herein, we review and discuss about a variety of ureteral stent materials and configuration, indications for ureteral stenting, techniques for placement and exchange of ureteral stent, as well as ureteral stent-related adverse events for safe management of ureteral stenting. I express my appreciation to the members of the Section meeting for ureteral stenting of the Japanese Society of Endourology (JSE), including Drs. Kikuo Nutahara, Akito Yamaguchi, Soichi Mugiya, Hitoshi Yamada, Junichi Matsuzaki, Satoshi Takahashi, Mitsuru Yasuda, Koichiro Wada, and Jun Miyazaki, as of April 2017 when the first edition of this handbook was published.